Remember the picture we posted back in October of the sky being reflected in the calm water of a nearby river here on The Witch’s Island? Well, they were having a photo contest at work to decorate the president’s office wall. You know, something to impress visiting customers with, and I entered that picture. Guess what. My picture was one of only three selected! Better still, each of the three finalists won a crisp new $100 bill! And even though it is one of the newly introduced plastic bills it’s still a hundred bucks, yahoo! That’s right, baby. The Witch is rich, sort of. It was a shock, but a pleasant one. This is the picture that won me a hundred dollars. So, what else have I been up to, you say? Well, I’ve been busy crafting away in my basement workshop. I created a little picture using shells and other bits and pieces I collected at the beach this summer while Hubby was in swimming. I really enjoyed designing this and the shells just all fit together nicely to make this scene come alive. I’ve already got some more ideas floating around in my brain and it’s going to be a long winter so I may try some more of these. I made this picture using shells and driftwood I found on the beach this summer. I’ve also been decorating the family room for Christmas. The fireplace mantle is one of my favourite things to work on. I love birds so I’ve given it kind of a nature theme. And some poor little elf must have fallen through the ice and gotten soaked. He seems to have left his clothes to dry by the fire. Someday I may find the right elf figurine to sit up there too but so far I haven’t come across one. He would have to be the right scale to fit the clothes and he’d have to be semi-naked or in his undies and that’s just a little too much to ask, I guess. I just might have to make my own. This is my mantelpiece all decorated for Christmas. I’m hoping you all enjoy this little up-date as it is only 7 more sleeps till the big day. Merry Christmas! and your photo is just wonderful...how do plan on spending that plastic money? I love the picture that won you the $100. It is amazing. Well done. You obviously have an artistic eye because your other creations are so good too. What a good idea to put a washing line across your mantle so the poor little wet elf can dry his clothes. Aaah! That picture is beautiful!! :) Treat yourself to something nice with that $100 bill! Congrats, Witch on your award-winning photo! You have such an artistic eye! If i were to try to glue a bunch of shells together, i think it'd be one, gloppy mess--it would definitely look homemade, and not in a good way, if you know what i mean. 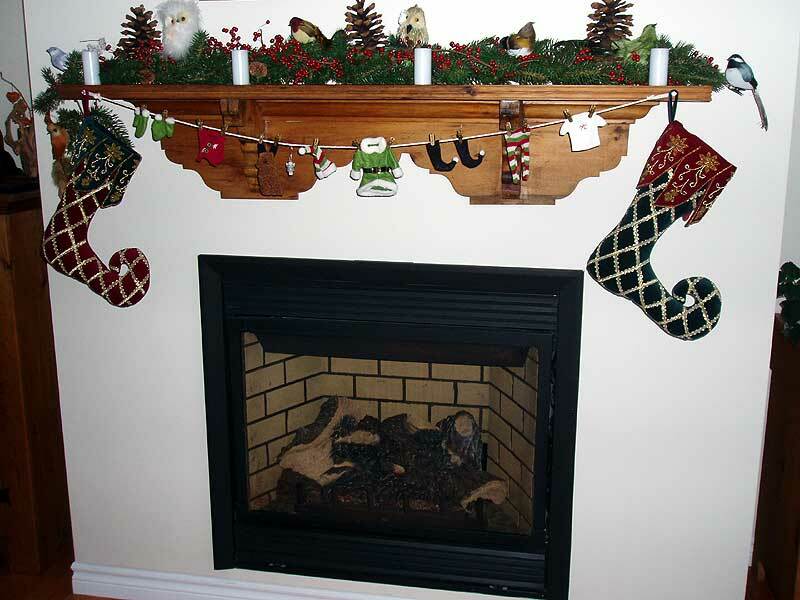 Love your decorated mantel. Hubby used some tiny white lights in faux willow branches this year on our mantel, and it looks lovely. I have a small, red elf there, too, but he is fully clothed and tends on staying that way. Congratulations!! I love the new $100 bills!! Can't wait FOR 2013 when the $10s and $5s go into circulation too. 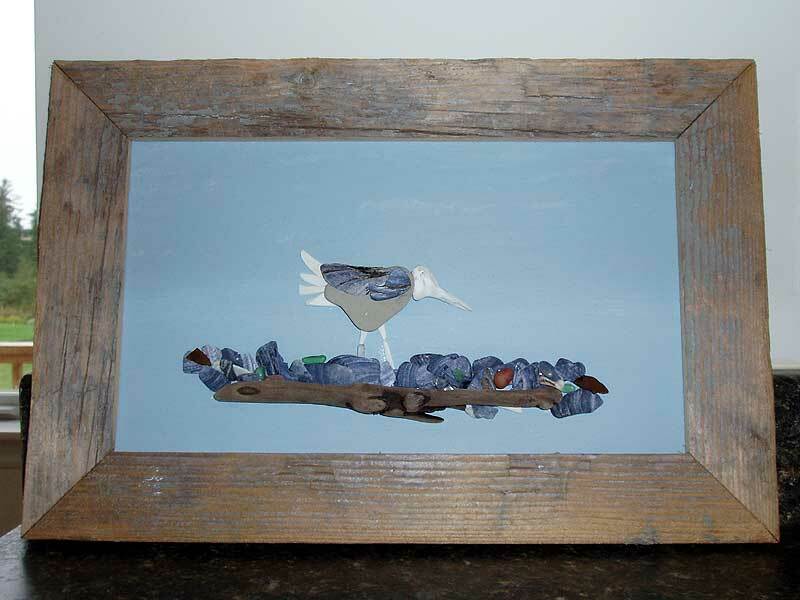 I love the bird you put together, amazing how shells and driftwood turned out when an artist put them together. 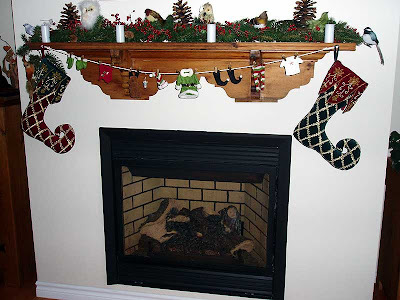 And I really find your mantle pretty, the elf clothesline is ADORABLE! well done you, and you did deserve to win it is a great photo. I also love the picture with the shells, you are very artistic. Any plans for the $100? Wishing you a very Merry Christmas as well my Island friend. 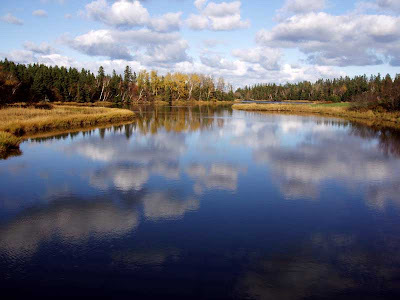 Congratulations on the photo win, truly a beautiful shot. I saw one of those plastic looking and had it in my hand 100 dollar bills, cool. I love our beaches for shells and beach-combing. You must tell me where you get your used boards for your frame, I love that effect. I'm trying to make a mirror and have everything I need except the boards. Merry Christmas and a Happy New Year. Thanks for all the support everyone! Cindy. we found that board just washed up on the beach the same day I made my "dancer" sculpture. It was just some random piece of flotsom that Hubby ripped into the stock for the frame. I KNEW that photo was a winner from the first time I saw it!! Congrats witch! You are a woman err...witch of many talents! I too am a bird lover and a lot of carvings I do end up with bird like shapes - just love curving organic lines. Merry Christmas from London, ON!! Okay, not really a witch, but then again, you know, maybe...depends on who you ask. Wow, My First Award For Blogging! Kill The Mortgage Fund Goal: $5,000 To Date: It's DEAD! Potting Shed Tour, Enjoy the ride. Witch Gazebo is Done? Well Mine of Course! Games Night is Always Lots of Fun. Granny New Year Came Sometime Through The Night.